Many organizations have a need for small task and projects that do not require a permanent setup. There are times when companies do not plan to take on operational activities by themselves and look for contract services which can take care of these activities for them. Here they have ample contract services available where the companies can choose the best possible option for them. The various types of job contracts that companies can offer, make them interested in the opportunity. But whether it proves beneficial to them depends on a lot of things. Employees can be hired with various different contract types; this means that employers have to be careful while planning what they are looking for. This one is well managed and well designed if companies know what kind of work they will be requiring. Here employees are hired for a limited number of hours and they are expected to complete a task in that time. They are paid either by the hours or the amount of work they complete. These types of employees are available for any extra work that organization has picked and are not a burden. The employees are just paid salaries and no extra perks and benefits are to be given to them. This saves the companies cost a lot. The catch is to utilize them fully when they are there; this involves a good amount of planning. The cost that the companies have to incur for contract employees is a lot less as there are no long-term benefits that need to be provided to them per employee contract law. This is another contract of employment option where companies can outsource a part of their work to other companies which in turn hire employees. They are not on the company’s payroll and are employees of other organizations but they are working for your organization. Here again, it is outsourced and hence, the employees are asked to adhere to company’s policy but the company does not have to provide long term benefits and extra perks to these employees. There are times when these employees work from the company’s location, here arrangement for transports, ID cards and similar things are needed so that they follow the rules and policies of the company but do not have to bear a lot of costs. This kind of contract employee generally takes care of administration services. Here the employees are hired for fixed number of hours for which they commit to complete the project. The employees are treated like regular employees and are given all kind of services. They do not, however, get long term contract employee benefits from the employer. This kind of contract employees are hired for a specific project and when the project is complete the contract is terminated. The cost is also fixed and employees are given salaries or payments when the project is complete or at specified intervals as decided in the contract. The project recruitment allows the organization to enjoy special benefits with the employees who have expertise in the area. Here the task force on contract get the work done in desired time and also are very professional. The company saves on a lot of expenses hiring contract employees this way. Experts in every field cannot be hired by all organizations. There are many situations where special consultation is needed especially when major changes are to be made in the office space. Consultation here is another employer contract service which organizations use. These consultants can be firms or individuals who can get the job done at the best speed and desired cost. The consultation services are very professional and the contract should be detailed in order to ensure that the employment offered is honored. The employees here manage time well and get the reports on the special needs. The employees here can be employed for special needs and consultation that is received is set to make the organization grow. This is a cost effective method for a very critical process. Volunteers are great for organizations who have less critical yet important work that can be shared. Volunteers work free of cost or with very low expectations. The work policy is the same for them and organizations should ensure the safety of the volunteers at work. The main aim of volunteers is to learn the process or to utilize them in free time. This works best for the organizations as they get employees who are motivated to work and are eager to learn. These volunteers can also turn into full-time employees if they show good performance on the job. There are no strict laws that are applicable to employing volunteers apart from safety at workplace and honoring the contracts. Volunteers are often seen making efforts to work relentlessly as they are often passionate about what they volunteer for. This kind of employees is available at all times, as the name suggests these employment opportunities can be offered right at the moment. The Zero hour contract is for skilled labors who are hired on a day to day basis. The contract does not require a lot of legal formalities, but safety in the workplace is a must. They are paid on a daily basis and there is often many employees available. The Zero hour contracts are highly beneficial for jobs which call for more physical labor and a large number of employees. Here an important point to remember is these employees are allowed to move out in search of other employment and the employer does not have a lot of control on that. However, there is no risk given the availability of employees and the daily nature of the work. Contract employees are definitely a great way to ensure that an organization never stumbles in the case of specific needs. As discussed not all parts of the process can have high budget systems and special care, the contract employees here comes in handy to get the work done and ensure that the organization grows in real time. There are mainly three benefits of having a contract of employment which is listed below along with the other benefits. 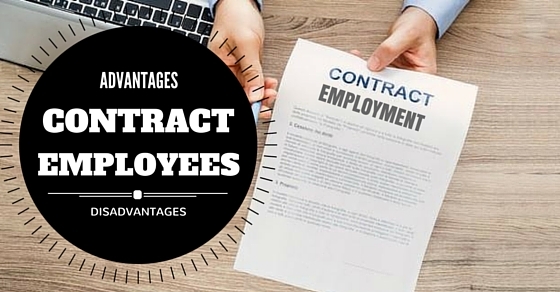 Contract employees generally come with a fixed cost. The cost of employing them is mentioned in the contract and the employer does not have any benefits or perks to pay them. There is also no maintenance cost, medical bills or insurance that needs to be covered for them. This saves companies a lot of money which is otherwise spent on employees. The contract clearly states the settlement amount and there is no hidden cost that is associated with it. Contract employees when efficiently managed make things done at a really low cost compared to regular employees and thus become a highly advantageous option. There is no high recruitment cost associated with it and also there is no paperwork that is expensive and cumbersome. The contract employees have flexibility in work and given that there are many options available for employers to hire them. The different types of contract employment that can be offered increase the options of a number of employees that can work for any organization. Employees that are available to work as contract employees have increased and the rate keeps on moving up which shows employers do not have to worry about it. Some types of contract employees have been experts in their business and they love the freedom they get working like that. This means an expert service for employers. The expertise the consultants and contract employees brings, gives employers a highly professional job at a huge success rate possibility. The expert service is available on a contract basis that means extra cost apart from the ones mentioned in the contract. The contract detail covers everything and employers can be less worried about the work. They can focus on their work and let the consultants get them the report they need. Contract employees come with less legal formalities compared to full-time employees. There is no paperwork required on a daily basis except for the contract that needs to be designed. The law does not require much paperwork with contract employees. The organization needs to ensure that all the important details are a part of the contract which is duly signed and then there is nothing many legal formalities to worry about. Contract employees need to do their own taxes. Unlike fixed employees where the taxes for the employees is to be done by the employer, contract employees take care of their own tax implications leaving no burden on the employer. This means that organization is also not liable for any tax that is due by the employees. The tax implication is solely the employee’s business and this burden is off the employer’s shoulder. Contract employees may sometimes create trouble for the organization and then it does not sound like the amazing option it did some time ago. Employees who are hired on contractual basis are told the policies they are supposed to honor. The reality is that employees who are working on contract basis miss out on following the company’s policy which may lead to serious trouble for the organization. Managing and monitoring the policy code becomes real difficult which may be the major disadvantage of hiring contractual employees. There have been issues with consistency when it comes to contractual employees. The employees who work on contract basis are often seen leaving the companies especially the part time employees. They may leave in between a project or may even not be handling any critical task yet they create continuity issues which are a major disadvantage. Inconsistency in carrying on daily task may even lead to a financial loss when it is related to not being able to fulfill any client requirements. Contractual employees are not able to create loyalty for the organization. Not all employees are disloyal but in general, it is seen that due to the temporary nature of the job most employees do not create that connection with the organization. This is reflected in their motivational level which they show towards their work. Motivation is highly needed to ensure that the work is done in time and with perfection. Every organization has this dire need to keep their employees motivated. They have programs, policies and processes to ensure that the team is motivated to work. It becomes difficult to involve the contract employees in these programs due to inconsistency as discussed. This leaves very little in the hands of the organization and changing this mindset is challenging. Employees who work on contractual basis do not sign any employee contract agreement with the organizations. The contract lays very simple terms and conditions that need to be followed. This sometimes creates legal complications with organizations when the employees breach any policy and the organization has to cover for it. These legal implications are an unnecessary burden and added cost for the organization. It is best that any critical work is not handed over to the employee unless the trust has been created. Working with contract employees is definitely an added option that organizations have but need to carefully use it. Contract employees need to be treated like permanent employees so that they create the trust and add to a positive culture in the organization. Contract employees are a parallel workforce for any organization which should be used critically and made as a strong support. There is a great potential where in these contract employees can be fully involved as its own workforce later. The benefits of being a contract employee are far more than the disadvantages and if managed properly hiring like this is always better.